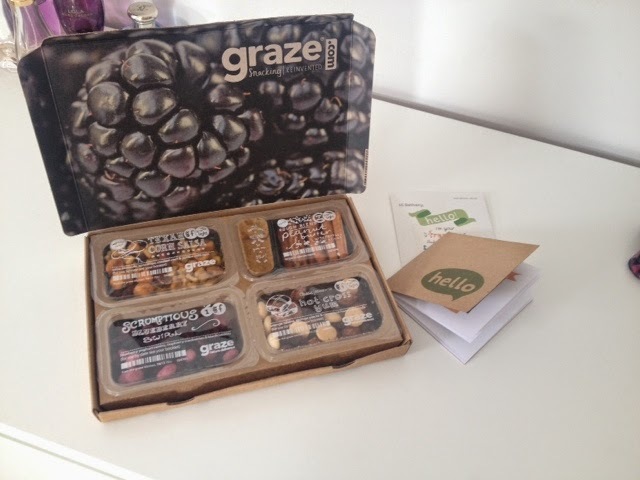 After a moment of spontaneity, my friend and I decided that it was about time to order a graze box! If you've heard or tried graze, you'll know that they specialise in sending 4 delicious, nutritious goodies to your door weekly. Ranging from scrumptious blueberry swirls to herby bread baskets, they have it all! What really grabbed me was the fact that my first box was free so I thought, why not! It only took 2 days to deliver and soon as it came I couldn't help myself but devour the whole entire box - oops. 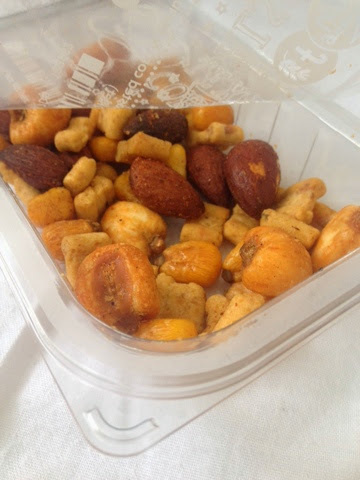 A spicy combination of dried nuts, seeds and sweet corn pieces. This really added a subtle kick to my tastebuds and wasted too spicy. The perfect amount of yoghurt to raisin ratio is hard to find but Graze's Scrumptious Blueberry Swirl ticks all the boxes. 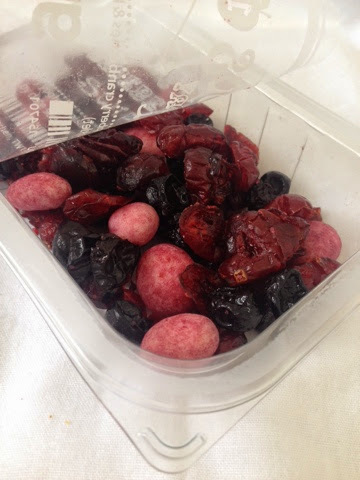 Amongst dried cranberries and blackcurrants the yoghurt coated raisins add a creamy delight. This has to be one of my favourites! Personally, I'm not much of a cinnamon kinda girl, since doing the cinnamon challenge it's basically scarred me for life. So when I read that the Hot Cross Yum had cinnamon in it, I couldn't touch it - I did help myself to the sponge pieces though. AKA heaven in a plastic pot. This was amazing. The peanut butter was roughly blended and the consistency was to a tee and as for the pretzel sticks, well they were delicious! Unfortunately, there is no close up photo to this because I couldn't wait to nibble at it. 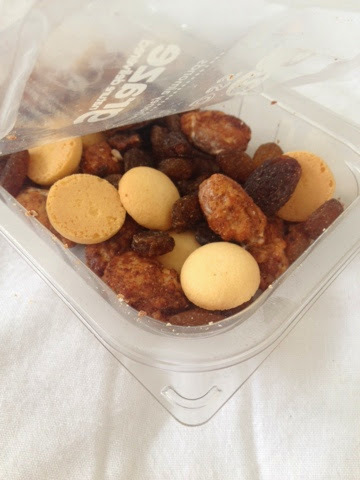 Hope you've enjoyed my graze box review. 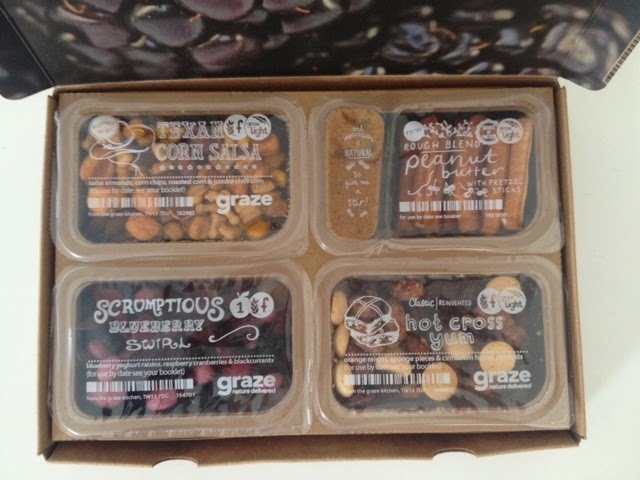 Be sure to check out www.graze.co.uk if you haven't already! 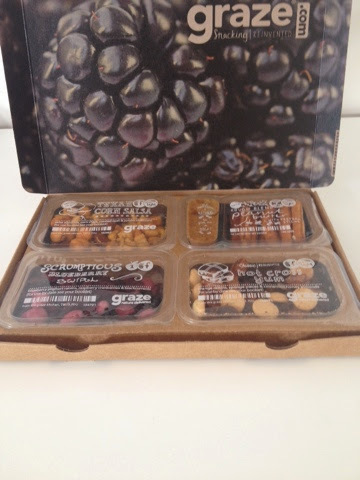 What's your favourite Graze Snack? Finally the weather has started to feel more like Summer and has cranked up a degree, or 10 to be accurate. 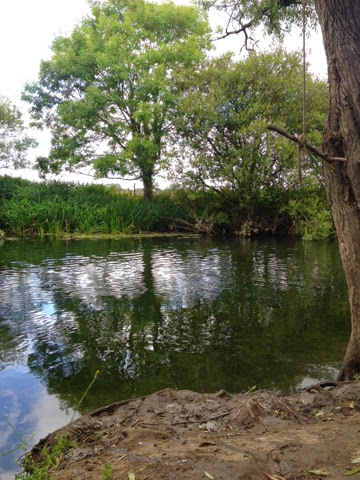 Now the true "summer vibes" are flowing it's time to get out and enjoy the summer whilst it lasts. Spontanaity has become my new best friend, and doing things that are planned at the last minute is basically how I've been living the last 2 months. Keep checking for more posts coming soon. 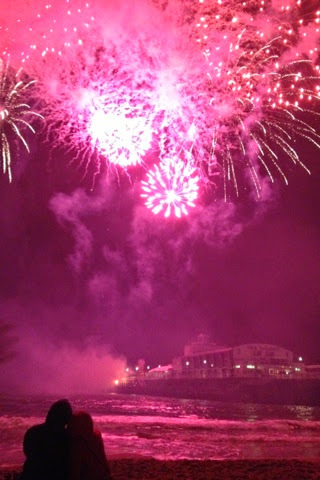 Unfortunately, Summer is upon us and we all know what that means, apart from the beach, late nights and BBQ's, it means colours. Every designers SS14 collection is all colour everything and there's no getting away from it. If, like me, you stick to the safe options of black and white, a small pop of colour is needed, c'mon you have to admit it. No, I'm not talking about purchasing a bright fuchsia top or bold mandarin skirt, but simply sprucing up something that lays before us. Fingernails! 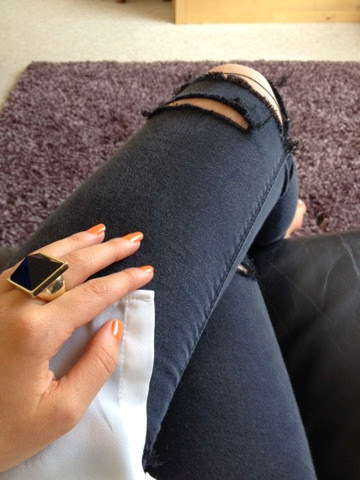 A flick of colour on the talons and any monochrome outfit is Summer appropriate! My favourite picks for Summer and SS14 in particular, range from pastels to bright bold colours to colours that can be worn all year round. 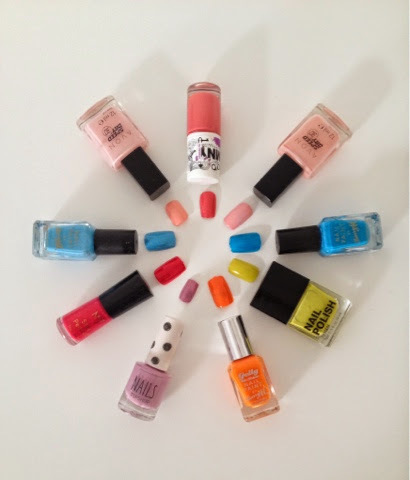 What are your must have SS14 nail varnish colours? I came across this tag whilst, surprisingly, searching for an interesting beauty tag. Hopefully it'll give you an insight into my history of past makeup mistakes and how the once "on special occasions" treat became an obsessive ritual. This is a bit of a beefy post, so arm yourself with a cuppa tea and some nibbles, and get reading! 1// Do you remember your first makeup item? As far as I can remember, I've always had makeup which I used for dance shows since I was about 3. I didn't start "properly" wearing makeup until I was in Year 6 - if you count tinted moisturiser and lip balm as makeup. So technically my first makeup item was Natural Collection's £1.99 Tinted Moisturiser, well that says it all really. I used to apply it all over my face with a makeup sponge and then smother my lips in my favourite fruity lip balm at the time. 2// Describe your perfect mascara? Have you found one that meets your specifications? The answer to this, is a big fat no. Finding the "perfect" mascara has to be harder than finding the "perfect" foundation, and that's saying something! I've lost count at the number of mascaras I've tried, you name a mascara and I've probably tried it (and hated it). Personally, I look for one that puts length over volume, as I prefer having longer lashes to volumised ones. From past experiences, I've found that mascaras that specialise in volumising your lashes usually flake and makes them look spidery and unnatural. The closest I've ever got to the perfect lash look is by layering different ones. Currently, I use L'Oreal Paris's Volume Million Lashes with No.7's Extreme Length and it seems to do the job for now. 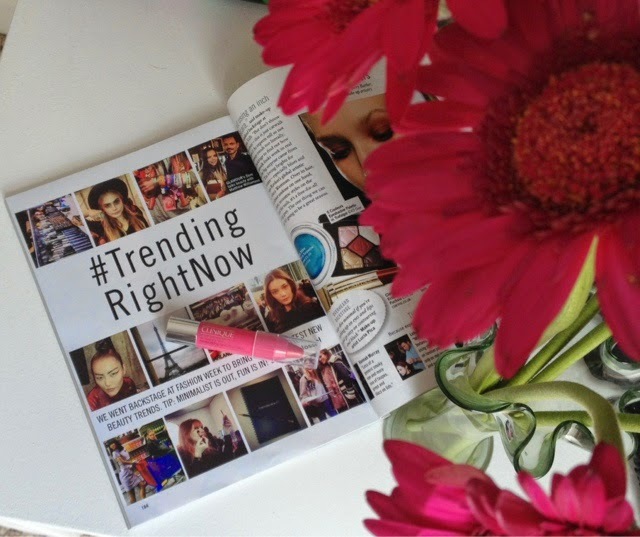 Carry on the perfect mascara search party! 3// What kind of coverage do you prefer from foundation? It has to be medium to heavy coverage. I mean what's the point in a light foundation coverage - all or nothing. The higher the coverage the less product used - uh hello smart saving. No but seriously I do love a good old heavy coverage foundation, it changes the look of my face and I like that. 4// Favourite High End Brand? Urban Decay, Urban Decay all the way! 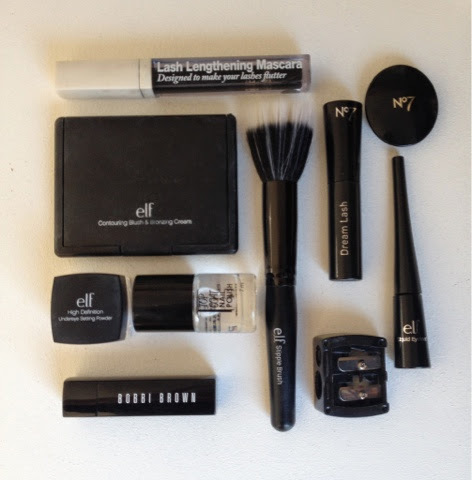 From palettes to primers, they come out on top for me. Closely followed by Bobbi Brown, Urban Decay never fails to impress, I mean c'mon, who has ever heard anyone say "I hate the Naked palettes." That's right, no one. 5// What cosmetic brands have you always wanted to try but still haven't? Oh boy, there's too many! But my top three has to be Nars; especially the Sheer Matte Foundation, Laura Mercier, who hasn't heard good reviews about her products, and finally and I guess I would like to give MAC a try. You'll be lying if you say you don't have a guilty pleasure for MUA. Even if their palettes aren't that good for your skin, the colours are still on point! For nails, it has to be Barry M, they always have exciting limited editions and more colour choices than Essie. 7// Do you wear false eyelashes? On a day-to-day basis, I would love to but I don't. I literally, physically can not put them on properly. However, if I'm getting ready with someone for a party/special occasion then why the hell not! 8// Is there any kind of makeup you can't leave the house without? I would love for the answer of this to be no, but unfortunately that's not the case. I have unbelievably oily skin and look shiny 24/7. The only thing that can control this is powder. I'm not a type of person who has to top up their makeup every 20 seconds but if I feel like my face (especially my nose) is getting a tad oily, then then Rimmel London's Stay Matte Power and a Kabuki brush make an appearance. 9// What is your most cherished beauty product? I've only recently started to become brave enough to wear lipstick and so my new Bobbi Brown Lipstick in Pale Pink has to be my most cherished beauty product because it means a lot to me - even though since that purchase I've bought 3 more to add to my collection (oops!). 10// How often do you shop for makeup? Do you like to pick up an item here and there or get lots of goodies all at once? I'd say I purchase at least a couple of makeup items every week. Some weeks it's a crazy splurge and others is a let's-be-serious-here mood that makes me see sense and my makeup buys fall down to only a couple. 11/ Do you have a "beauty budget" or do you spend freely? Why did this question have to exist?! Now I've seen this, my good side has realised how much of a clever idea this is and it's probably going to become a new rule of mine - brilliant. 12// Do you utilise coupons, rewards cards and sales when you shop for cosmetics? Hell yeah! Most of my beauty buys are swayed by them being on offer or me having a coupon for them. Luckily, this does make them a less guilty purchase but still most of the time they are unnecessary. 13// What type of product do you buy most of? It has to be foundation. Almost on par with the struggle that is finding the perfect mascara, finding the perfect foundation is still an ongoing mission of mine. From drugstore to high end concession, from every review to recommendation, the perfect foundation is still out there, I just can't seem to find it. 14// Is there a brand that you absolutely can't stand? I can't stand Benefit. Their packaging just sends out a piss take vibe and to me it seems like a joke. I've tried many a time to try and warm to it but I just can't seem to. 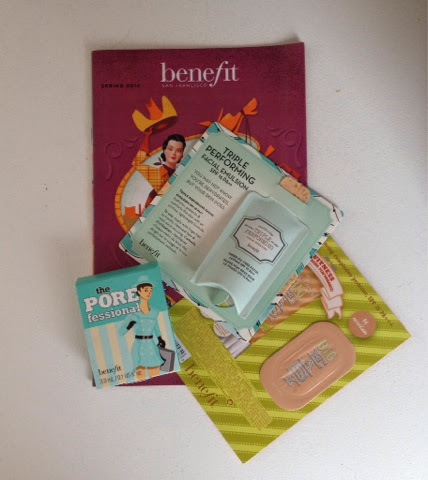 Three of my freebies from my last post are Benefit and I'm hoping this is the final push into me being able to tolerate the brand. I mean, imagine if THE foundation is by Benefit and I'm too stubborn to try it, I've just got to bite the bullet and give them a go. 15// Do you avoid certain ingredients in cosmetics like parabens or sulfates? It's always a bonus when products don't have certain ingredients but I mean, who really cares anymore. 16// Do you have a favourite place to shop for makeup? Where ever stocks what I'm looking for is usually where I go, but sometimes I look around online for the cheapest place. However, one day I'd love to shop at Sephora, it looks so beautiful! 17// Do you like trying new skincare products or do you keep to a certain routine? I prefer to keep to the same until my skin gets used to it and then I go review reading crazy and find the next best thing! 18// Favourite bath and body brand? Generally I usually buy what's on offer but The Body Shop never fail and their products always smell great - bonus! 19// If you could only buy from one brand, what would it be? I'm torn between Bobbi Brown and Urban Decay....I'll get back to you on that. 20// What brand do you think has the best packaging? I love the Nars packaging because it's simple and black (who doesn't love black) but it's a sucker for foundation and finger marks, so it has to be Bobbi Brown. 21// Which celebrity always has great makeup? Kim Kardashian. Need I say more? 22// Do you belong to any online makeup communities? No and I'm glad, otherwise this obsession could get out of hand. Who doesn't love a bit of Zoella, eh?! 24// Do you like multifunctional products like Lip and Cheek Stains? I don't really trust multifunctional products if I'm honest. Even though I use eyeshadow to fill in my eyebrows, products such as Lip and Cheek Stains don't appeal to me. 25// Are you clumsy when putting on makeup? I think everyone is, especially when in a rush. However, if I have time, taking care in how I apply my makeup is a major concern. 26// Do you use a makeup base/primer for your eyes? Funny that this came up as was recently researching which brand has good eye primers. Watch this space. 27// How many hair products do you use on a typical day? All in all, not that many. If I wash it, it's just shampoo then conditioner. Blowdrying it adds another in the form of a heat protecter. However if I don't wash it, dry shampoo becomes my best friend. 28// What do you apply first, concealer or foundation? I used to apply concealer then foundation but one day I did it the other way around and haven't gone back since. 29// Do you ever consider taking makeup classes? I'd love to! One day I think I would just so I can reassure myself that what I'm doing is right! However, my makeover with Bobbi Brown was partly a lesson/tutorial as well and everything she did is similar, if not the same, to what I do anyway - phew! 30// What do you love about makeup? Oh boy, where do I start! I love how many versatile looks you can create with makeup and how it can be tailored to everybody. But the thing I most love is how it can make me look polished and airbrush out any flaws - especially spots. Hallelujah to makeup! Wow, it has finally come to an end! I hope that wasn't too bad. Stay tuned for another post coming soon. I tag you to do this 30 Beauty Question Tag! A girls gotta do what a girls gotta do, right? Well with that in mind, my friend Megan (from meganleonardd.blogspot.com) and I, set out on a mission to see how many free samples we could get in one day, hashtag cheapskates. I must admit, I was surprised at how successful our trip was. 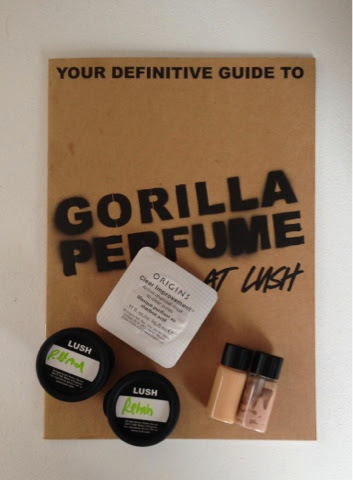 From Benefit and Urban Decay right down to Lush and Origins, we managed to get a hell of a variety of free products. Totalling up at 16 between us, we did pretty well. All the products we collected as free samples were products that we had either read about prior to, or products recommended to us by the makeup artists. When asking for free samples, don't be shy, free samples exist for a reason and makeup artists are willing to give them out to interested customers. Nothing's more exciting to a makeup artist than when a customer knows what they're talking about. Have some key words to throw at them when asking about a specific product - they'll love that. Although above I've called them "free samples", when asking just mention samples. Subconsciously, this implies that, later down the line, you'll be interested in actually purchasing the full sized product - clever eh? So why not give it a go yourself and see what samples you can get. How cute is this little thing? Yes, I know I'm late onto the bandwagon but hey ho, I'm on it! I did a bit of a cheeky thing though. Instead of purchasing the £17 version, I took advantage of Glamour Magazine's freebies - can't turn down a good freebie, eh? 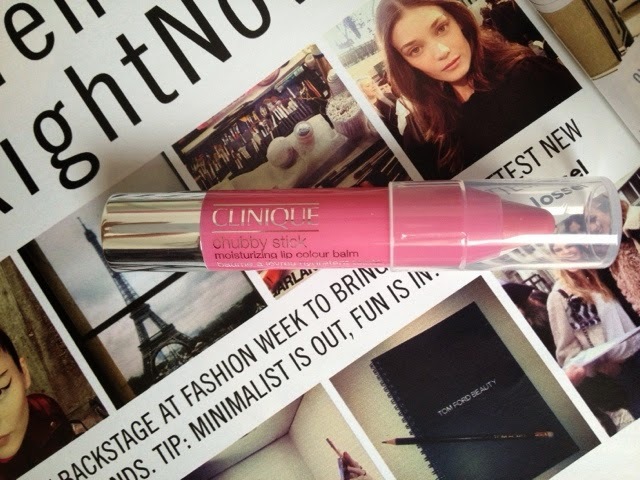 Anyway, for their August edition, Glamour have four Clinique products worth over £40 up for grabs, and it just so happens that the chubby stick I was after is one of the four! It must be fate! The chubby stick (still can't get over how cute the name is) is in the colour "woppin' watermelon" and is a bright pink colour. It's the perfect tone and great for adding a pop of colour into your look. As for it's job, it labels itself as a "moisturising lip colour balm" and that's exactly what it is. Having just the right amount of colour to call itself a lip balm, the moisture is down to a tee and as for the colour, well it's spot on. So if you're still unsure whether the £17 version is worth it, head on down to your local corner shop and pick up your own Glamour and try for yourself! What's your favourite moisturising lip balm? Wait what? 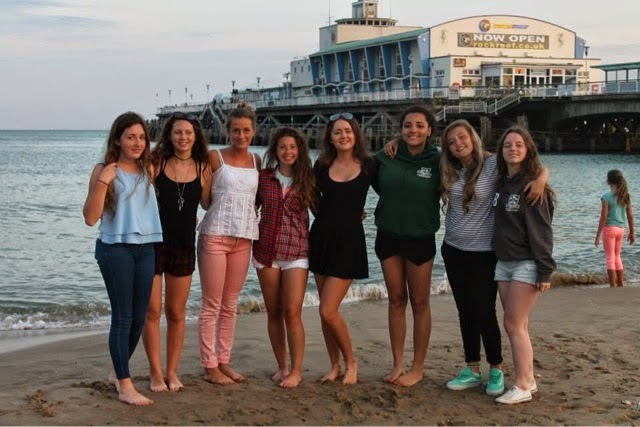 Who on earth thought wearing makeup to the beach was a thing? But if you're skin isn't on top form, there's some pesky spots on the horizon, if you're face isn't 100% "beach ready" then makeup is, quite frankly, a must. No one wants a heavy foundation in sweat-worthy heat, so stick to a light BB, CC or even DD cream, yes DD cream (sigh). High end or drugstore, it's all about trial and error, finding the one that's best for you - any excuse for a cheeky splurge. Forget about the eyeshadow and eyeliner. Curl your lashes and apply some mascara, waterproof mascara (obviously). 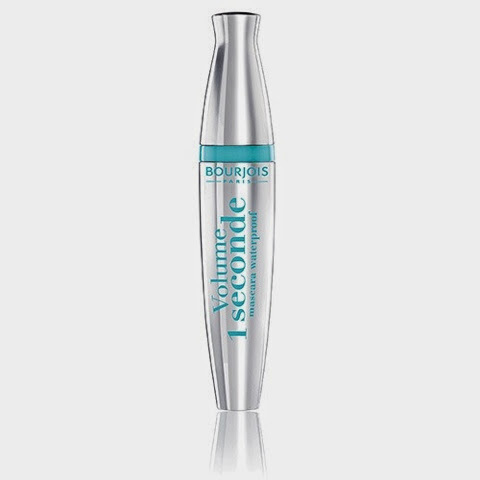 Bourjois' Volume 1 Seconde Mascara at £9.99 is an investment worth making, not only for beach days but also stay-at-home-movie days where you find yourself uncontrollably sobbing at The Notebook. Or, if worst comes to worst and hayfever strikes, whack on a pair of sunnies, no problemo. Don't go for anything special. Get yourself and tropical flavoured lip balm, and that'll make you feel like you're on holiday. 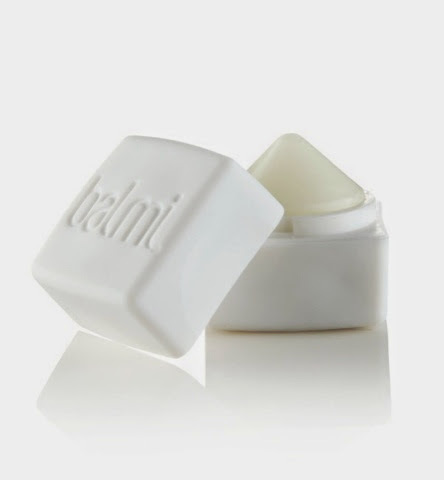 Try Balmi's Coconut Lip Balm Cube, it's pocket sized and cooler than stick shaped balms. 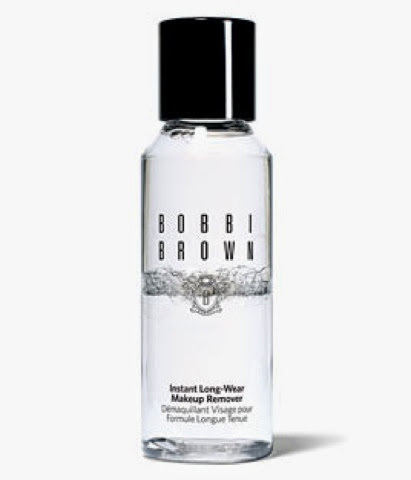 Now the hype has gone down about L'OREAL's Micellar Water, other makeup removers can shine through, including Bobbi Brown's £17.50 Instant Long-Wear Makeup Remover. Only needing to use maximum of 2 cotton pads per face, this claims to not leave the annoying oily residue afterwards, winner. And there you have it, makeup made for the beach or the less beach ready of us. On occasion, give you're skin a break and use a trip to the beach an excuse to do so. 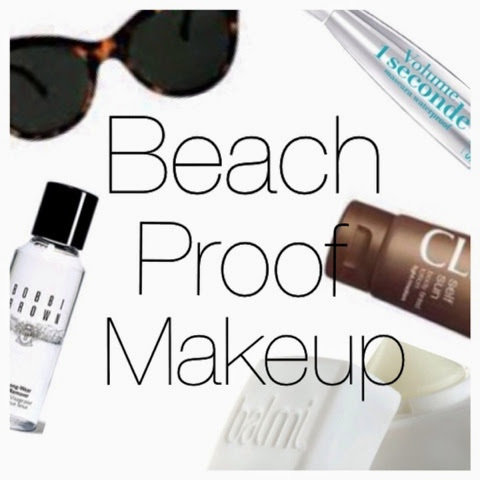 What are you favourite beach beauty products? A two part post, beginning with the mini edition and then, you guessed it, a not-so-mini to follow on later. A pretty self explanatory one to start off with - these are to listen to music obviously! These make any lonely walk or bus ride more bearable even though they're a b*tch to untangle. Thank you Apple. Any girl (or guy) knows how annoying a broken nail is, especially when wearing delicate clothing - one snag and that's it. 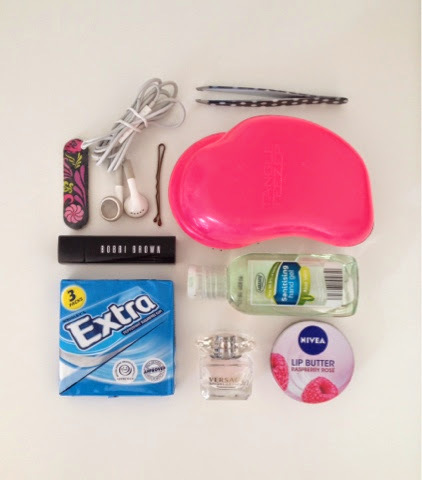 This mini-file is perfect to slip into any sized bag and does the job. Simples. We all have the one bit of hair that well just doesn't seem to agree with us. Even though I swear I have never purchased any in my life, these hairclips seem to breed in their thousands around my home and some even make it into my bag. A small, yet handy piece of metal that can save any bad hair day. 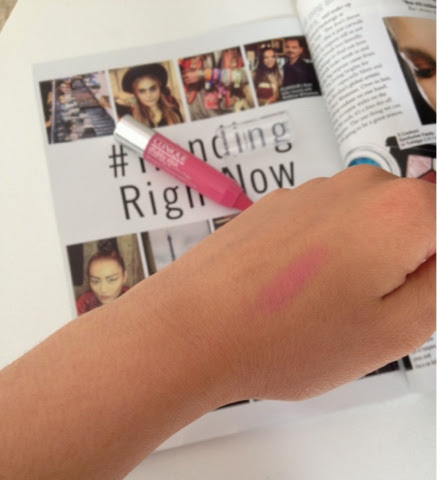 On this occasion Bobbi Brown was the winner and this Pale Petal shade is oh so gorgeous! The lipstick you apply before you go out has to be taken with you, just incase you need to re-apply - obvs! Okay, so maybe I did overdo it on the gum, three packets is more than enough, one will do for the day. I'm the sharing sort and the type to help a friend in need of a, well let's just say a little refresh. A.K.A. a women's weapon. Not only to they keep your brows in top form but act as the ultimate "does everything" type of tool. From removing splinters to well just about anything, this beauty essential can do it all! A gift from the Gods, the Gods who realise how much knotty hair and painful hairbrushes are the bane of any girls life. Handheld and hair helpful, there isn't a time when I'm no more than 3ft away from my Tangle Teezer. If you know me, you'll know that I'm always armed with my Tangle Teezer in one hand and my dry shampoo in the other! If your "second day hair" is in need for a spruce up, I'm your girl. No matter who you are, where you are or where you're going, this is a must! Not all public toilets are kept clean and refilled, you never know when the hand soap has run out - better be safe than sorry! Plus who likes germs anyway? How cute is this little thing? I never leave the house without a good old spritz of perfume (among many other things), and always need a top up now and again. Rather than carrying the big bottle with me, which takes up an awful amount of valuable space, I take my trusty mini with me instead. My current favourite is Bright Crystal by Versace, it's a good'en. For one of those "Where's my lippy?" or "Man I have cracked lips" days, a lip butter or balm always comes in handy. The one in question is Nivea's Raspberry Rose and does the job of relieving dry lips as well as leaving a gorgeous pale pinky tone as well! And so the first half of this two part special has come to an end. Be sure to stay tuned for the next and slightly larger second half. I'm sure every visit you take to your local department store, whether it be the likes of Beales or Debenhams, results in all the high end make up brands making you want their products more than you want, well, anything! But no, it's still the drug stores that I make my frequent purchases in on most occasions. However much I dream of my make up bag being filled with all high end brands, there's no harm in putting together a small lust list is there? After my recent makeover with Bobbi Brown (not the actual Bobbi herself) I've become obsessed with their products and this chic compact caught my eye. The Bobbi Brown Shimmer Brick (£37.50) comes with four gorgeous beige-y shades, it edges up from light to darker tones and can easily be used as bronzer, highlighter and eyeshadow. How versatile! Next on my hit list is something that sounds perfect for me. Nars Sheer Matte Foundation (£30) is said to be made especially for oily skin - uh that's me! 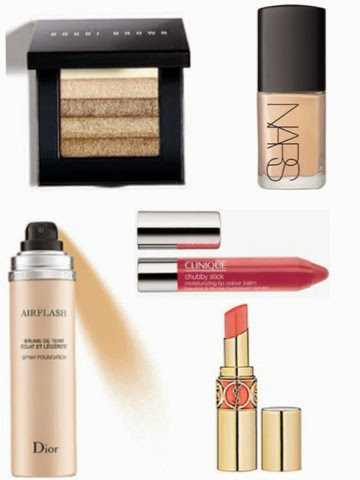 We all want velvet looking skin and Nars Sheer Matte Foundation claims to do that! Perfect for covering stubborn spots as well, the Sheer Matte Foundation can be built up to achieve any desired coverage. A firm contender on this High End Hit List if I do say so myself. The third product seems to be one of those hello-why-haven't-I-heard-about-this-before, type of products. One question, who doesn't want to look airbrushed? I know I certainly do! The Diorskin Airflash Spray Foundation (£36) allows you to have perfect airbrushed skin minus the expensive equipment. Still at a hefty price, this foundation is ringing alarm bells in my head, I guess it's a must have! 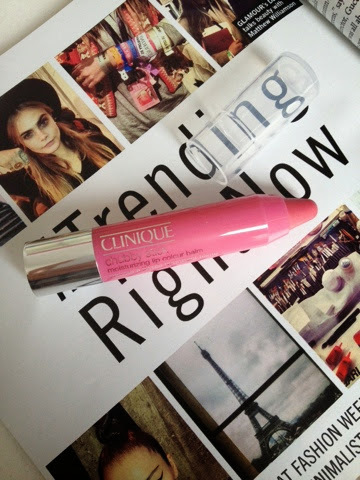 The most beauty conscious of us either own or have at least heard of Clinique's Chubby Stick (£17). I mean c'mon, how cute is the name! 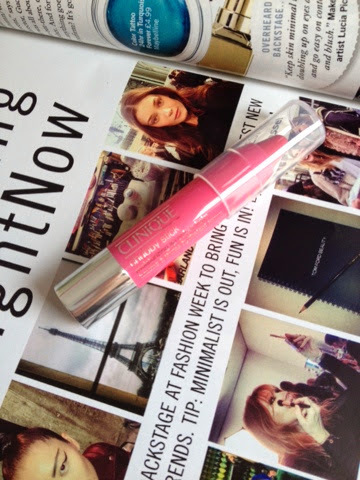 This Chubby Stick, isn't only cute but also a moisturising lip treatment that relieves dry, cracked lips. The unique pencil-style applicator provides quirkiness and looks like your colouring in your lips like a colouring book (be careful not to go over the line!). Not to mention it comes in more than 20 colours, there's one for everybody, so pucker up. Finally, another lip product but this one has packaging to die for. Yes, you guessed it, it's a cheeky YSL number. The YSL Voluptè Shine (£25) is shiny, protecting and smudge-free, what more could you ask for in a lipstick? Oh yeah, a wide variety of beautifully pigmented colours, well YSL ticks ALL the boxes. My favourite colour has to be "Peach Passion" and I'd love to venture into the orange side of the lipstick world. Did I mention the packaging is to die for? That concludes my High End Hit List, be sure to check out my other posts if you haven't already! Disclaimer - if you're really hungry I suggest you don't read this because it will physically pain you at the amount of food mentioned in this post. Food, glorious food to say the least! As I am writing this, I am currently in a food coma and don't plan on eating for another year. 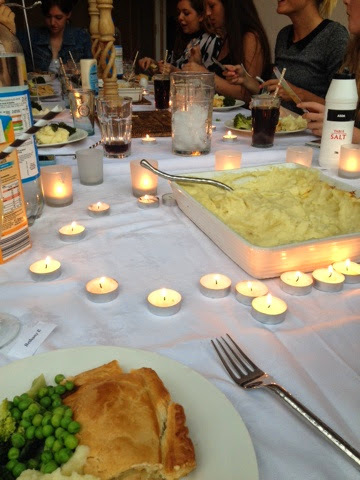 I spent my Friday night at my friends house, we had, what I thought was going to be a dinner party followed by a sleepover which actually then turned into a giant feast - it looked as if we hadn't eaten for weeks! 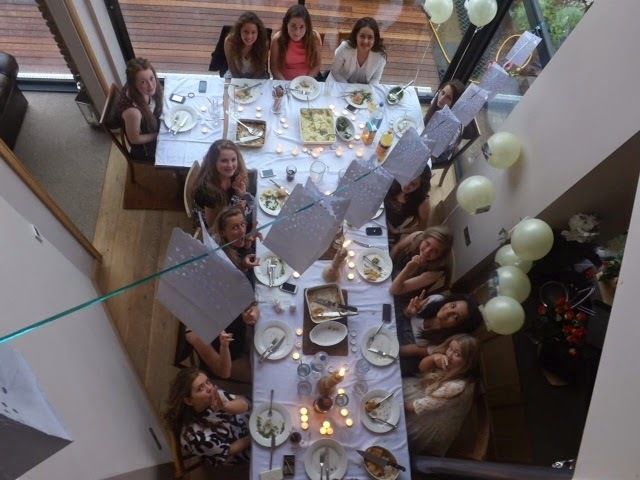 This food filled dinner party stroke sleepover was, minus the achy belly, a lovely chance to catch up with friends now that we have broken up from school. With only a few pictures to prove, my friend, Sidonie, made a lovely homemade pie with all the trimmings plus dessert! I've never felt so full in my life but let's just say, it was well deserved! 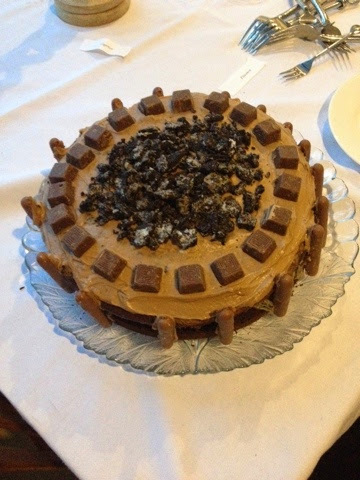 And to top it off a whopping great big Chocolate Oreo cake was made, as if I wasn't full enough! The night was ended with a campout on her third floor. Decorated with fairy lights, candles and endless amounts of bedding, we all snuggled up and shared scary stories - obviously. 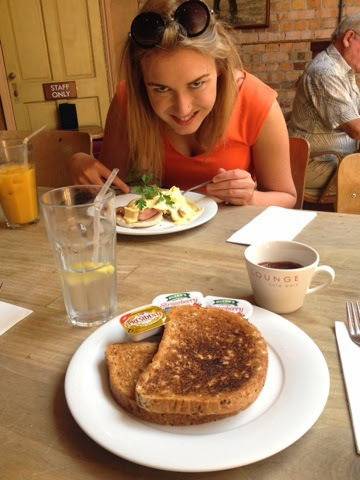 Deciding that we weren't full enough, the next morning we went out for breakfast in our local town at a cute little cafe named Kelly's Kitchen. 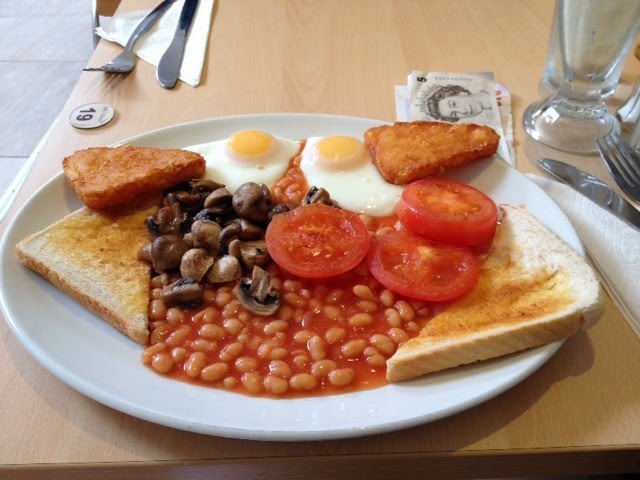 We all managed to bag ourselves a bargain and get a typical English Breakfast for only £2.50, praise the Lord for the early bird special! I also ordered myself a cheeky iced latte too mmm. I feel the urge to go on a 100 mile run now to burn off the 1 million calories I have eaten but the weather isn't great so I guess I'll have to spent the rest of the day inside watching films - shame. Apologies for this impromptu and poor attempt of a "What I've Been Up To" post. I hope it hasn't made you too hungry. Begin by pouring the cup of water into your glass, this should fill it up half way depending on the size of your glass. 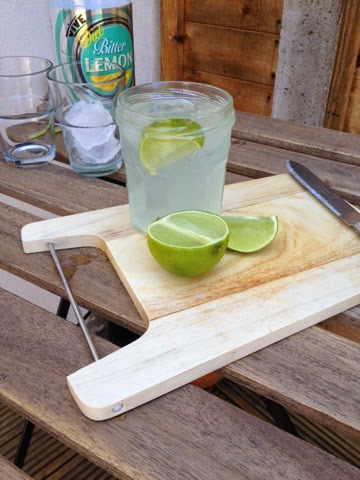 Next, pour in the bitter lemonade (or normal lemonade) until the glass is 3/4 full. 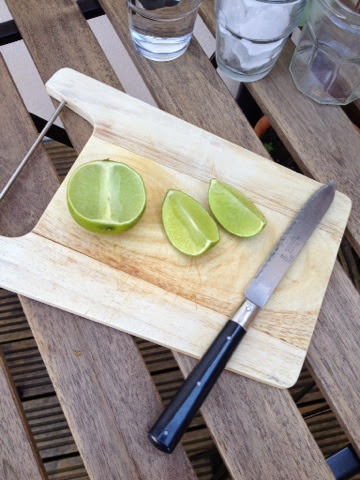 On the chopping board, slice the lime in half and half again until you end up with one quarter. Chuck in the ice cubes and using your straw, give it a good stir around. 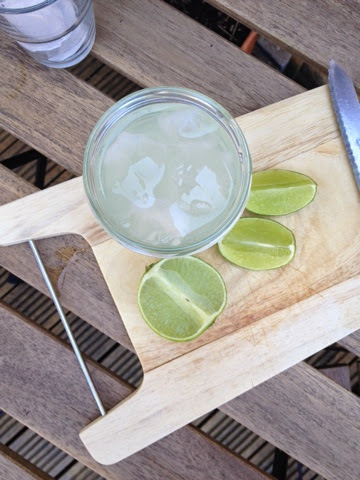 Next, squeeze the lime into the glass and then drop it in. 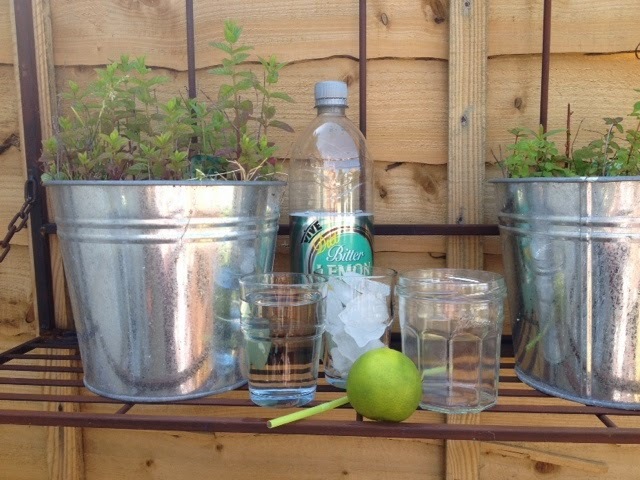 If you're fortunate enough to grow your own mint, grab approximately 7 leaves and sprinkle them on top of the drink. If you don't have mint at home, most supermarkets sell fresh mint in bags fairly cheaply. Pop the straw in and enjoy! 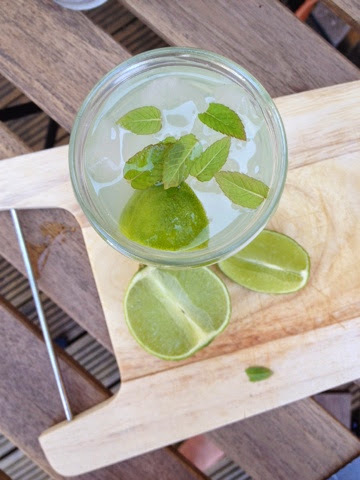 Put your feet up and lie in the sun with your Cool Fresh Mint Lime Refresher. A perfect companion to a hot day that'll sure cool you down! Hope you enjoyed EditedStyle's first ever recipe post! Stay tuned for more! 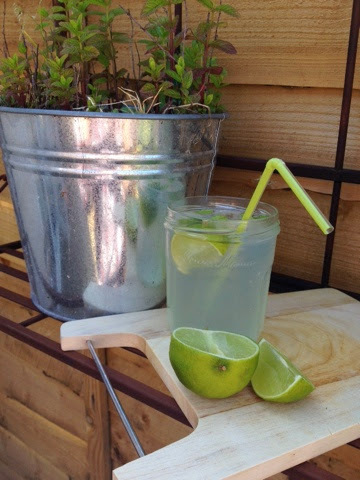 What's your favourite beverage to have on a hot summers day? P.S. Try growing your own fresh mint in your garden!